Today is the funeral of Venerable Dr. Chhean Kong, abbot of Wat Khemara Buddhikaram, who died last week. Locally known as Wat Willow, it is one of the oldest and largest Khmer temples in North America. 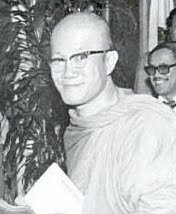 Because of his background both as a Cambodian and a monk, Chhean was uniquely suited to treat Cambodians suffering from mental disease and trauma, such [as] post traumatic stress disorder and depression. In its early years, Wat Willow also offered a variety of social, community and cultural services, including weekend basketball tournaments for Khmer youth and adult day care for the elderly parents of working adults. You can read more at the Long Beach Press-Telegram; the funeral announcement can be viewed here in Khmer and in English at KI Media.